I am so ready to go! Once again, this year’s Birthday Bash was another fabulous Registry Members event. What a great time we had, and everyone enjoyed seeing the new C6 Z06. This is truly America’s super car. (I can’t wait to get my hands on one of those animals!) As always, the seminars were great and the Corvettes were beautiful, but the best part of our Birthday Bash is the renewing of acquaintances with old friends and making new ones. It was very special to me to have a number of our Charter Members present this year. It was like a first year Birthday Bash Reunion. These members were the first 200 members in the Official C5 Registry and it gave me a real thrill to reminisce with them about the early days. 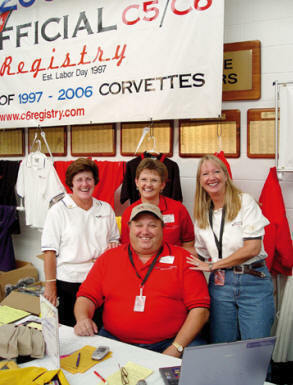 Many of you have heard the story that when Jake and I started the Registry, my goal was just to have a few Corvette enthusiasts to sit and chat with about the new C5. Little did I know from that beginning on Labor Day 1997 with 21 members that this group would explode into a worldwide organization with almost 8,000 members to date. I can honestly say that I’ve had very little to do with it. All I did was provide a structure, but the real credit for the growth of the Registry goes to the enthusiasm of the members and their willingness to bring more members in to share the C5/C6 FUN! It’s a pretty large extended family now and I sure hope we have the FUN quotient at the forefront of what we do. I know the FUN quotient was certainly at this year’s Birthday Bash. I could see it on faces and hear it from all of you! One of the highlights for me was going back to having a Registry party to celebrate our common interest. I hadn’t realized how much I’ve missed this FUN get-together at the Bash! In fact, everyone has told me how much FUN they had, so in the future, the party and dancing will take center stage. After all, this is all about having FUN with your good friends and I saw an awful lot of members kicking up their heels and having a fabulous time. I really enjoyed and appreciated those members who got dressed up in the 50s attire and danced up a storm. Chaz and Gael Cone [C5R# W0526] never fail to surprise me, and Gael’s outfit was really something! Kent Cartner [C5R# W1092] looked like he just stepped out of the pages of a 1955 year book. Buzz and Jackie Nielsen [C5R# W0492], Charlie Goss’s [C5R# V0040] wife Leslie, and John and Bonnie Bittle [C5R# M7357] dressed to add to the flavor of the evening. A big C5/C6 THANK YOU goes out to all of them! So look for more FUN and excitement at upcoming Registry dinners throughout the coming year, and look for some new ideas at next year’s Birthday Bash. The Birthday Bash is a big part of our Registry. I want to thank all of you who jump in and volunteer to make it happen. Big C5/C6 THANK YOU’s to Chaz and Gael Cone and Buzz and Jackie Neilsen, who were kind enough to bring their pearl white Commemorative Edition Corvettes, which is a cool blend between a ‘53 and a C5, for everyone to enjoy. Also helping us at the table were Judy Miller [C5R# K6817], Dianne Thurn and Cindy Shockley (from the Registry office). Many of you probably already know Judy Miller of Corvette’s @ Carlisle. Dianne Thurn is the wife of our newsletter writer/photographer/ reporter and all around good guy Walt Thurn. They were recently married this past December and Walt hasn’t stopped beaming since their wedding day! Other members helped out throughout the Bash, sitting at the booth, taking pictures (a big C5/C6 THANK YOU to Matt & Ingrid Parker [C5R# X2200]), recording seminars and just helping us do whatever needed to be done. That’s the great thing about every member of the Registry, is that you are always willing to help and pitch in any way you can. We heard some great remarks from David Hill, Chief Engineer of Corvette and Larry Martin, Chairman of the Board of the NCM about the beginning of the Birthday Bash and the Official C5 Registry’s part in establishing the Birthday Bash as one of the premier Corvette events in this country. If you have never been, I encourage every one of our members to come on down next year and experience one of the best Corvette get-togethers ever, the 9th Annual C5/C6 Birthday Bash which is April 20-22nd, 2006. Put it on your calendar now! For all you race fans, please remember that there will be tents and Corvette Corrals at all of the ALMS races except for Mosport (Canada) which takes place during the Labor Day celebration at the NCM. The Corrals and tents are brought to you compliments of IMSA, GM Racing, and Chevrolet in conjunction with the NCM and many other local Corvette organizations. The Corvette team this year looks great driving the new C6-R. If they come to your area, I encourage you to organize your local Corvette Club and friends and go spend a day at the races cheering on our favorite marquee to victory. I can guarantee you that you will have a blast. If you have any questions about any of the race events, please drop a line to the C5/C6 Registry office and we’ll do our best to help. Be sure to check out the first two race reports in this newsletter. Well it’s time to get back to my packing……let’s see……where is my shaving kit and my European electric adapters…… I think I may just throw in my driving gloves (a very continental look don’t you think? ), lock up my luggage and head to the airport. Le Mans, here I come with a herd of Corvettes and about 30 of my best friends! Top: Registry Director Dan Adovasio was assisted by Judy Miller (left) [C5R# K6817], Cindy Shockley and Dianne Thurn all Birthday Bash weekend.Thanks ladies! 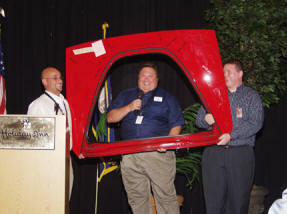 Center: Picture this... Director Dan Adovasio is framed inside of a C6 hatch painted Monterey Red, that was auctioned off at the Museum. Helping are Adam Bocca (left) and Mark Meredith (right) from the NCM.